After living in Colorado for 22 years I discovered South Boulder Creek after a train ride to Fraser with my aunt and uncle in early August. 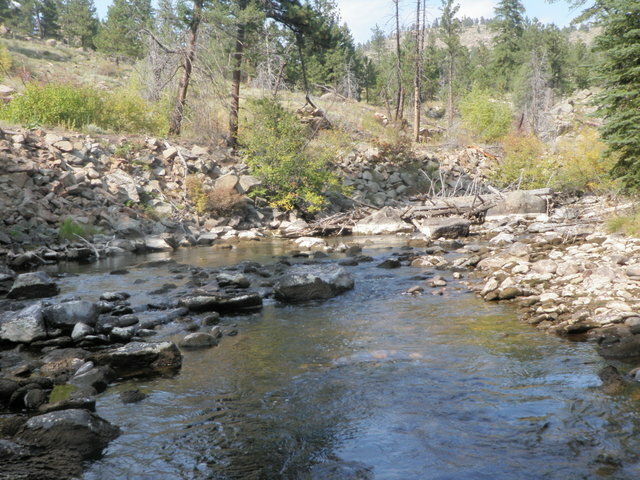 I fished there twice and the first time the flows were 167 cfs making it difficult to cross the stream. The second time the flows were 105 cfs, and I felt this was pretty close to being ideal. What would 10 cfs be like? Read on to find out. I finished the financial package for the month of August at work by 11:45 on Thursday and drove home for lunch. 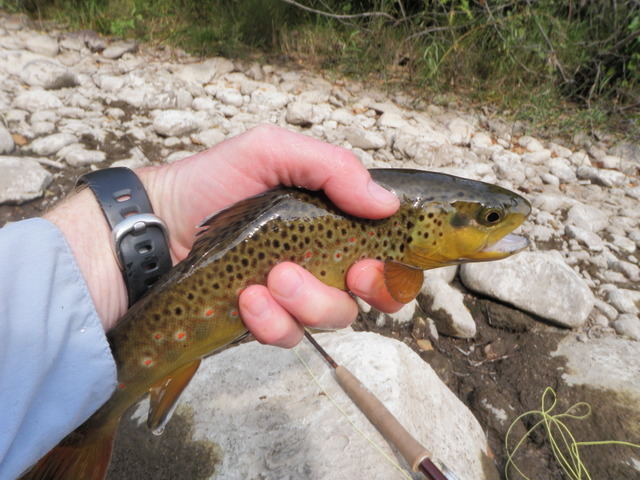 I contemplated fishing in the afternoon and decided to give South Boulder Creek a try as it is only an hour drive, and I felt I could get in two to three hours of fishing in the late afternoon. During my last trip the fishing actually picked up in the later afternoon as a pale morning dun hatch evolved. I didn’t bother checking the stream flows out of Gross Reservoir before I left. As I slowly negotiated the twisting dirt road and caught my first glimpse of the creek, I was surprised to see extremely low flows. It took me an hour to arrive at the parking lot below the dam and by the time I put on my waders and rigged my rod it was 2PM. Another fisherman was in the parking lot removing his waders and finishing up his fishing outing, so I asked him about the low water conditions and how the fishing had been. He told me the flows were 20 cfs (I later checked the DWS web site and discovered they were actually 10 cfs), but the fishing was actually quite good in the morning but slowed considerably in the afternoon sun. He was using a small midge fly and caught most of his fish on that. When I started descending the steep trail to the stream I passed a couple returning from fishing, and they indicated the fishing was good as well and suggested using a tungsten tongue. I was only dedicating a couple hours to this venture, so I decided to continue on and find out what it was like. How bad could it be? When I got to the bottom of the trail and caught my first full extended view of the stream I was shocked. It looked like a series of linked puddles with 65% of the stream bed exposed and displaying a steady boulder field covered by an olive brown slime. I decided to hike for 20 minutes and try to get below my point of entry on my last trip so that I would explore new water. This worked out and I entered the stream perhaps .25 minutes below my previous entry point on my last visit to South Boulder Creek. During my last trip the light gray comparadun began producing late in the day so I opted to begin my approach with this fly. I began at a nice long narrow smooth pool slowly moving down the center of the creek bed and began making long prospecting casts with my fly. I estimate that on average I was casting 25 – 30 feet in the wide open areas, and I was making shorter casts when I was close to the trees and willows or I was casting to faster moving water. Initially I observed several refusals to my fly, but when I got to the top of the run with faster moving current I began to pick up some decent sized browns. Catching browns was unusual as I landed almost 100% rainbows on my previous two trips. The pattern I just described pretty much continued for the remainder of the afternoon until perhaps 5PM. I covered a lot of water, experienced some rejections, but also landed some decent fish on the money fly. 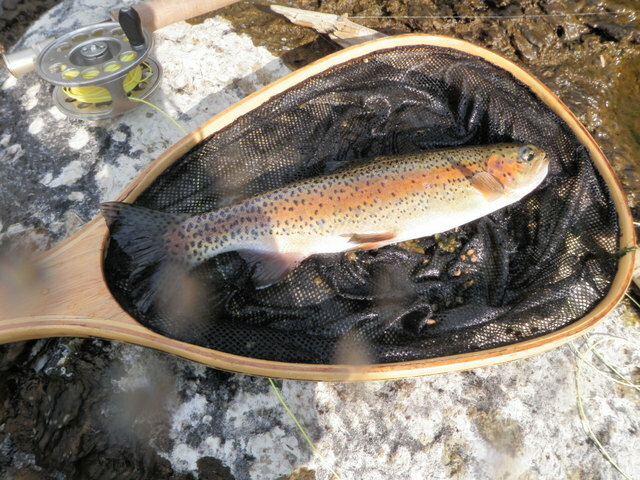 I probably landed rainbows and browns in a 50/50 ratio and the rainbows were on average larger. My best fish were rainbows in the 12 to 13 inch range, and they were spunky and brightly colored. By 5PM I’d racked up 13 fish landed and began getting refusals even at the top of the pools where faster moving water was entering. These locations previously had been the best producers with nice fish taking the money fly with confidence. Shadows began to extend across the entire stream area, and I noticed more caddis bouncing around on the surface, so I swapped the gray comparadun for a deer hair caddis constructed with the same color body. This seemed to work as I landed three more fish including a very nice rainbow before calling it quits at 5:30. 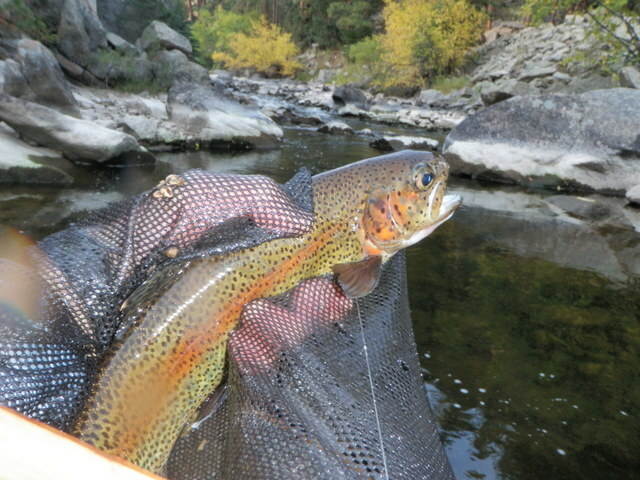 It was still quite pleasant temperature wise, but I needed to return to meet Jane for dinner; however, I could have continued fishing South Boulder Creek in 10 cfs flows until dark. I’m glad I followed through and wasn’t scared off by the low water.